Preheat oven broiler on high temperature (with the rack 3 inches from heat source) or grill on medium-high heat. To prepare burgers, combine ground turkey, scallions, pepper and egg, and mix well. Form into 1/2- to 3/4-inch thick patties, and coat each lightly with olive oil. Broil or grill burgers for about 7 to 9 minutes on each side (to a minimum internal temperature of 165 degrees). Combine mayonnaise and mustard to make a spread. 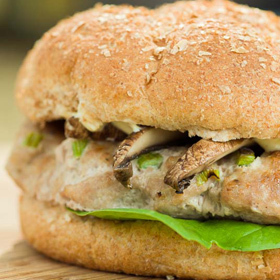 Assemble 3/4 tablespoon spread, 1 ounce spinach or arugula, several slices of grilled portobello mushroom (optional), and one burger on each bun. To grill portobello mushrooms, scrape off the gills from underneath the mushroom caps. Lightly coat with olive oil, and grill or broil for 2 to 3 minutes on each side or until tender. Slice and set aside until burgers are ready. Serving size: 1 burger with toppings. Amount per serving: 299 calories, 11g total fat (2g saturated fat), 89mg cholesterol, 26g carbohydrates, 29g protein, 5g dietary fiber, 393mg sodium, 424mg potassium.